Customers are looking for quicker responses, instant solutions to problems and prompt answers to queries. While CRM solutions can unequivocally assist companies to achieve this objective, the limitation might arise when a part of the company’s staff does not have access to this office based software. According to research by VDC, a third of a company’s staff is mobile. This is quite a telling number and shows how employees are increasingly hitting the field rather than just staying inside their office. Another research that stitches this fact together was recently conducted by Nielsen. As per the study’s findings, 50% of the total USA mobile market is captured by smart phones. CRM solution companies have realized their clients’ need to access their software while on the field and are making use of the increased presence of smart phones to do the same. In the face of diverse competition it is essential to meet customers face-to-face while staying informed about work related updates while travelling. CRM applications are available which can be accessed and updated through a smart phone or a tablet and this has heralded a bouquet of benefits to the system. With mobile CRM, the sales force can benefit through any time and anywhere access to customer details and secure real-time sharing of information related to activities, deals, payments, contact details and more. Details can be shared of other leads and accounts for a particular territory with a member of the sales force when they are travelling. Shane, a high level sales executive, has scheduled a meeting with an important customer in another state. He accesses the centralized CRM data repository through his mobile CRM and studies the customer's entire history including past purchases and key contacts. He suggests a few changes to his head office to appease the customer further and takes a cab to the customer’s office a few mile outside of his city. Before entering the customer's office, Shane checks his mobile CRM for any new details and notices his colleague has shared details of the receptionist's name and social profile. Taking a mental note of the information, he speaks with Ms. Scarlett and impresses her with a ticket to her favourite band's concert, which he books from his phone. The successful rapport building encourages her to bring forward Shane's appointment and he can now pitch to Mr. Hailey before his competitors. The customer asks for a quick turnaround time, Shane discusses their prior track record and some similar past purchases. On the way back from his successful business trip, he updates the mobile CRM with a description of Mr. Hailey and the key elements of their discussion. Shane then creates a new opportunity and assigns new activities to his team who are in-sync through the CRM solution. One of primary benefits of CRM solutions with a mobile platform is that data is shared securely without requiring telephonic conversations in crowded places or at a customer's office premises. Also, with access to mobile CRM, your sales force can continue to be dynamic without compromising on access to customer information through a secure platform. For example, if a meeting with a client will finish an hour earlier than expected in a foreign city, a colleague can immediately share details of other warm leads within a 5 Km radius with whom an appointment can be requested. Security: from a user and the organization's perspective, accessing and updating data should be secure. Depending on a user's role, the person should be given read/ write permission and visibility for other's records. Compatibility: The software should be compatible with the existing systems at your organization. Deployment: You should be able to deploy the software without extensive IT efforts and complications. 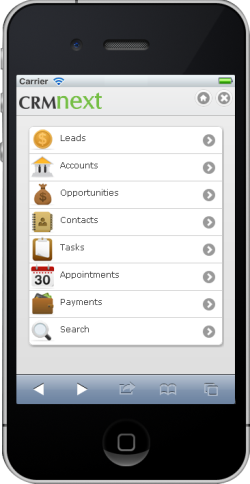 Ease-of-use: the mobile CRM interface and navigation should not be complicated and hinder quick access to information. The entire point of this solution is quick and easy access to customer and related information in unforeseen circumstances or without access to an internet enabled laptop or tablet. Customizable interfaces: to ensure user friendliness, interfaces should be uncluttered and display only pertinent details for different levels of the hierarchy. To facilitate high adoption, the mobile CRM's layout should be customizable.